Rug Industry News covers Rugs, Home Textiles, and Home Fashions. Open to everyone in and affiliated with the rug industry from machinery manufacturers to product manufacturers, vendors, reps, retailers, design firms and designers. Rug Industry News wants to feature your pictures and your press releases, and your events. Coming soon we will have a Calendar of important events on the homepage. Broadly defined, the Calendar will include trade shows, boutique shows, exhibitions, charitable events, parties, and people. OUR MISSION: TO SHARE YOUR PASSION FOR THE WORLD OF RUGS. Designing, making, and selling rugs is a global business and has been since before the beginning of recorded history. Through our publications we cover the whole gamut of subjects affecting the Rug Industry, Home Fashions, and Textiles. We talk to and visit with manufacturers, retailers, wholesalers, and designers. We attend trade shows in the design fields – as well as other industries. We visit museums. We read books. We talk and visit with friends in many rug producing countries. After 42 years in the business, we still are learning. Our main office is located in Morris, NY. But our staff are located in Eastchester NY, Brooklyn NY, Asheville NC and Los Angeles CA. The magazine is printed in Fulton MO. Writers come from all over the world. 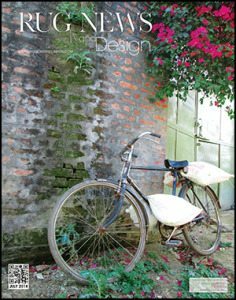 Rug News andDesign is a 12x magazine printed monthly. It started as a trade publication for the retailers of area rugs. As the market has changed, so has our audience; we now address interior designers, retailers, wholesalers, and manufacturers. Our articles cover the current design trends, the marketing of rugs — from display techniques to inventory control and market analytics — the production of rugs — both handmade (tufted, hand knotted, and flat woven) and machine made – and the history of rugs. We delight in sharing the knowledge of experts in their fields — designers, manufacturers, historians. The Internet lets us expand our audience to the consumer who is curious about rugs — worldwide. 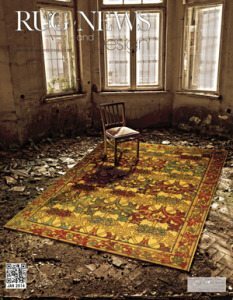 On RugNewsandDesign.com we have over 100 articles from our archives explaining different facets of rugs — from history, to designs, to production methods, to pictures of the people and places where these rugs come from. “Rug Basics” is a graphic illustration of how different handmade rugs are produced. For some it is more than they ever wanted to know, for others it will be a starting point. We will link to more and more other educational sources as time passes. We cover 13 trade shows a year, photographing the newest introductions of each of the exhibitors, and posting them before the end of the show.